River Cauvery is considered most sacred ~ in the words of Thondaradipodi Azhwar – ‘more sacred than the Sacred Ganges’…. ~ and in that beautiful island formed by Cauvery [Kaveri and Kollidam] reclines Lord Ranganathar. Azhwars, many sages and saints have left a rich treasure for posterity, in the form of classics containing all information about God and how He is ready to respond to the devotees' sincere pleas. ஆபாதசூடம் ~ from the feet to the crown, perhaps was his resolve when he started singing, but he cannot take his eyes off the Thiruvadi. Such was his bakthi – it Sri Thirup Paanazhwar whose thirunakshathiram “ Rohini in Karthigai month” – that we are celebrating today (26th Nov 2015). In Thondai mandalam, the moolavar will be anointed with ennai kappu from Tthiru karthigai day and there will not be purappadu after. 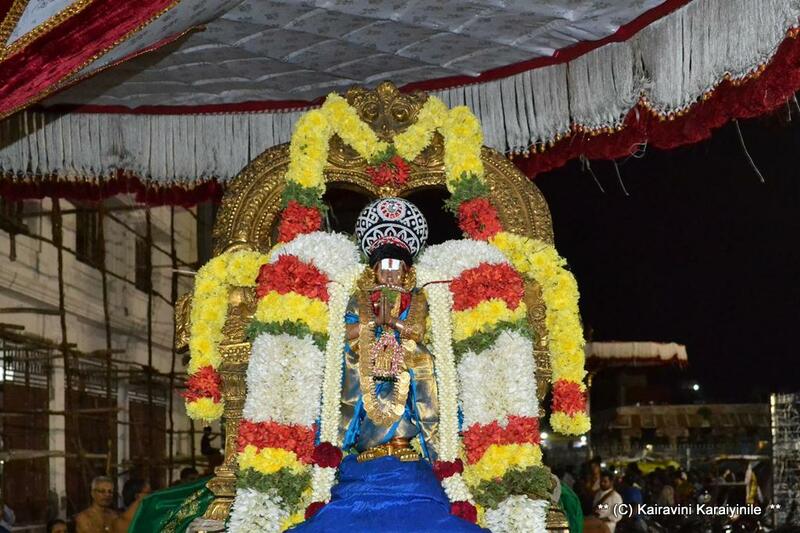 Hence generally, there will not be sathrumurai purappadu for Thiru Panazhwar. 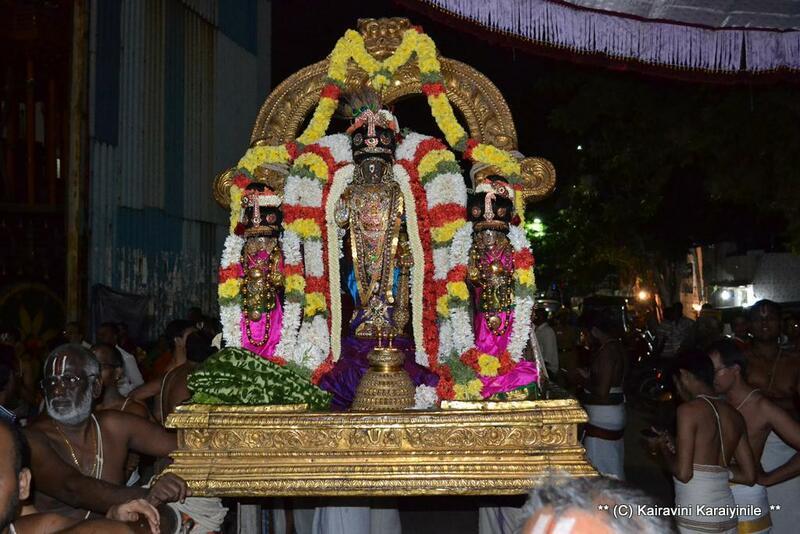 This year, Karthikai deepam is being celebrated today - yesterday was Sarrumurai vaibhavam of Thirumangai Mannan. The Azhwar, an amsam - Sri Vatsa of Sriman Narayana was born at Uraiyur and brought up by Panars who sung mellifluous paeans in praise of Lord. Such was his blemishless devotion to Lord Aranganathar that he claimed that he does not want to see anything else with his eyes that saw the most benevolent Lord Arangar. ~ அண்டர் கோன் அணியரங்கன் என்னமுதினைக் கண்ட கண்கள்மற்றொன்றினைக் காணாவே. Thirupanalwar used to come to the banks of Cauvery, deeply imbued in bakthi he would sing with deep anubhavam about the kalyana gunams of the Lord every morning. 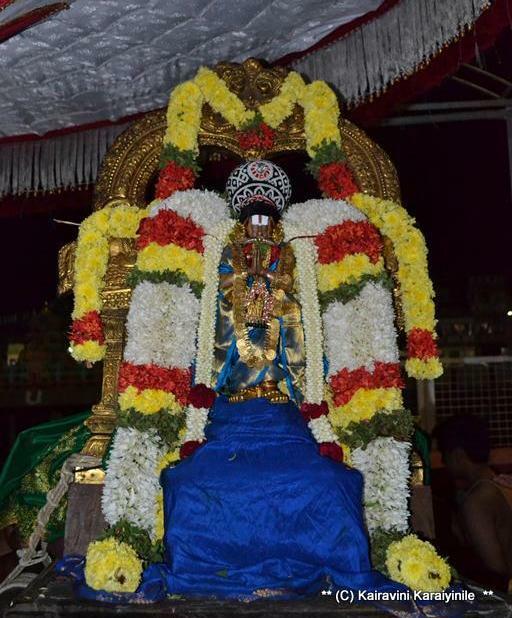 In the divine Naalayira Divya prabandham, his contribution is Amalanadhipiraan – ten in number. His prabhandham is different from the rest in a way that it does not contain any upadesams or anything else but only hymns in praise of Lord Ranganatha alone. Those well versed in sampradhaya state that they are aanandha-lahari (limitless outpourings of the bliss of aanandham) at the anubhavam of the Soundharyam of Arangar. 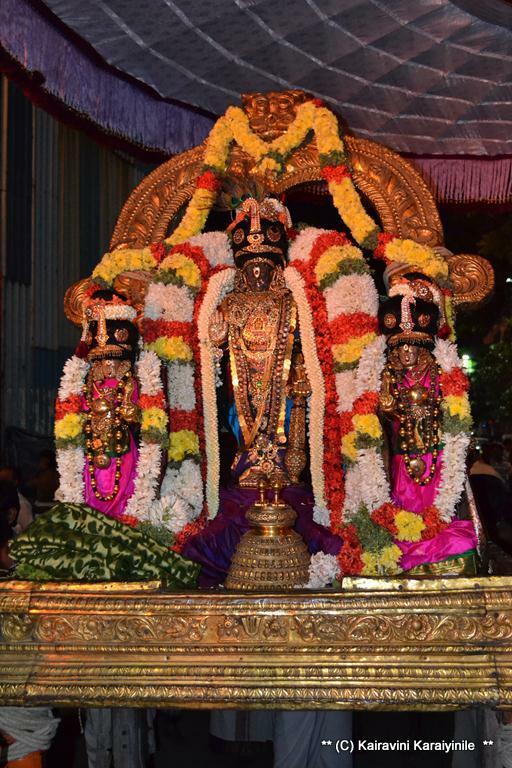 Today at 8 pm, Sri Parthasarathi had purappadu on the occasion of Deepa Uthsavam after lamps were lit all over the temple and in all sannadhis. 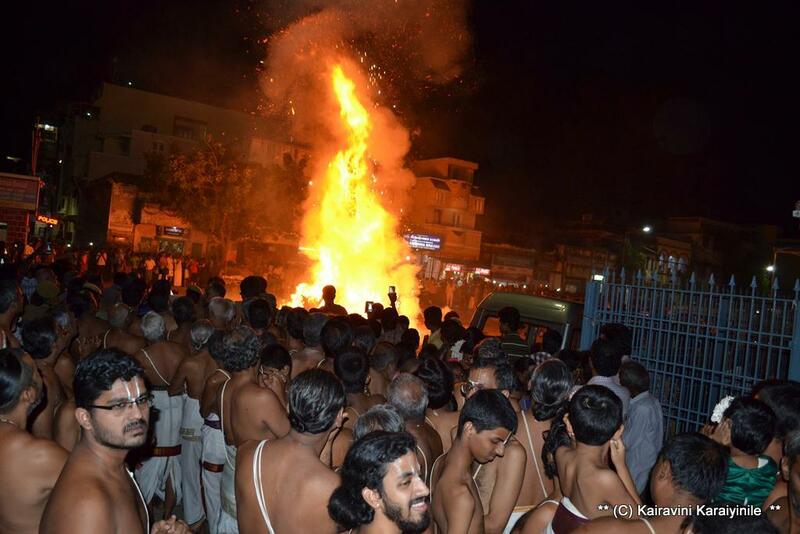 The highlight of the day is the lighting of ‘chokka panai’ – a structure made of palmirah trunk and leaves stuffed with rice bran etc., ….. people put fireworks also into this bonfire. This symbolizes burning of bad behavior and unwanted elements ~ the lamps symbolize blossoming knowledge. From midnight of today, there will be thailakappu for Moolavar and there will be no darshan of moolavar in Sri Parthasarathi temple. This period is known as ‘Anadhyayanam’ ~ a period whence Divyaprabandham and Veda will not be recited in Temples and at homes. This tradition is followed in all Divyadesams. At Thiruvallikkeni divyadesam, from tomorrow during Nithyapadi [daily rituals] only Upadesa Rathinamalai will be recited and in addition, Thiruvaimozhi Noothandhadhi of Swami Manavala Mamuni will be recited on the Thiruvadhirai and Moolam days. From the Danur masam [margazhi] Thiruppavai will of course be recited. The Adhyayana Uthsavam i.e, Pagal Pathu and Irapathu Uthsavam start on 11th Dec itself. On the 6th day of Pagal Pathu falling on 16th Dec 2o15, Thirumangai Azhwar’s Thirumozhi will be recited and at the time of rendering of Sthala pasuram ‘Virperu Vizhavum Kanjanum Mallum’ – screens will be off and from then on devotees will have full darshan of Sri Venkata Krishnan, the moolavar and other moolavar idols. This year on that day Danur masam [margazhi] is also born. 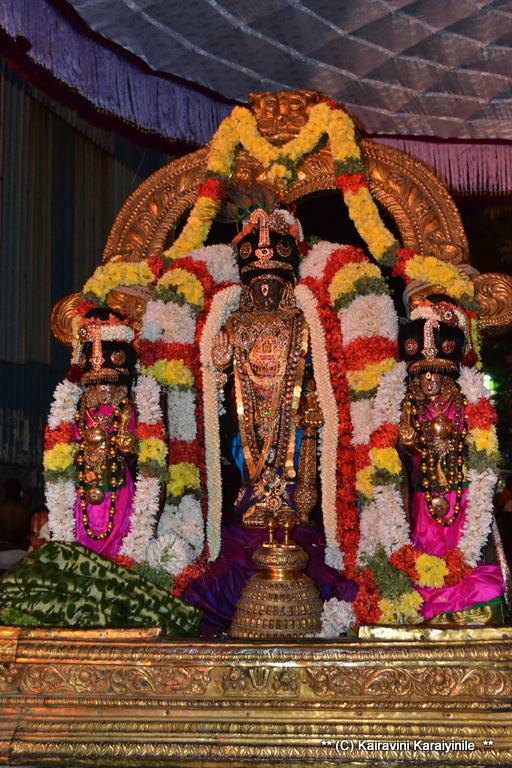 For 4 more days till Vaikunda Ekadasi, falling on 21st Dec, devotees can have darshan of Sri Venkada Krishnan without His trademark moustache…………. Here are some photos of Thirupanazhwar with Sri Parthasarathi taken during today’s purappadu – also some photos of the ‘chokkapanai’ being lit for the Karthigai deepam. 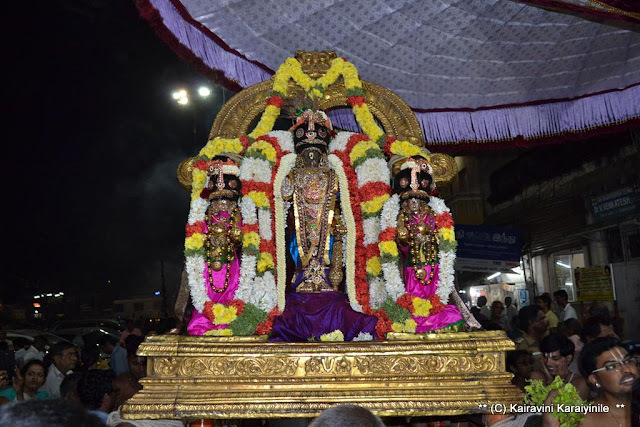 It is the day for us to fall at the glorious Lotus feet of Sriman Narayana, get rid of our sins and concentrate on doing kainkaryam to the Lord and his devotees.